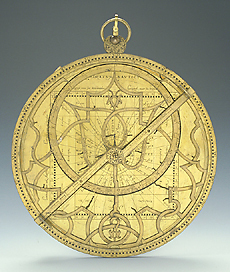 This astrolabe, which has no latitude plates, bears various markings relating to its use in navigation. The instrument is engraved with a quadratum nauticum which has the names of the winds in English, Greek and Latin. The rete bears the normal astronomical and stellar markings. The maker was Thomas Gemini, and the instrument is marked with the incomplete date '155'. The instrument belonged to the bequest left by Robert Dudley to the Grand Duke of Tuscany Ferdinand II de' Medici on his death (1649).